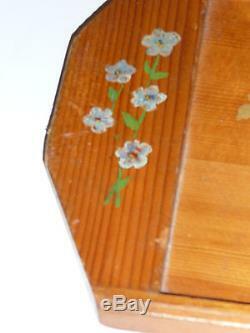 Charming & Unique Vintage American Spruce Wood Floral Serving Tray historic Posey Mfg Co (Hoquiam, Washington) handpainted floral decoration. This charming and unique tray is a piece of history from the timber and lumber industry in the American northwest. Posey Manufacturing Company Posey MFG. -- a firm founded in 1908 in Hoquiam, Washington --- made this delightful rectangular serving tray (with angled corners). It was made of SITKA "AIRPLANE" SPRUCE (which was their specialty); if you look closely you can see the beautiful fine grain of the wood. The Posey Company made spruce sound boards for pianos and spruce structural beams for planes; they also supplied high quality woods for famous guitar makers (for example, Fender and Gibson). If you google Hoquiam, Washington ---- and Posey Manufacturing Company ---- you can learn even more about their places in the history of the Pacific Northwest. For years made spruce sound boards for pianos and spruce structural beams for planes --- and throughout much of the twentieth century, it supplied high quality woods for such famous guitar manufacturers as Gibson and Fender. 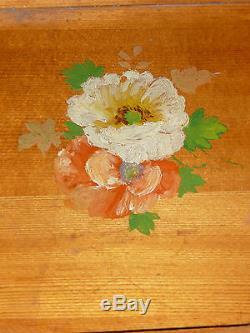 They also made household goods such as this tray in the late 1920s and early 1930s. So this little wood tray is a vintage "souvenir" of an American manufacturing company that contributed to the history of American aviation and American music. 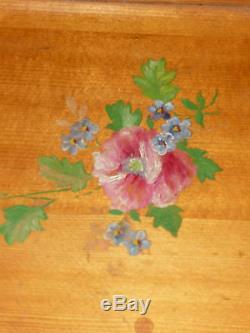 The floral or garden motif of the hand painted decoration includes pink, blue and white flowers. 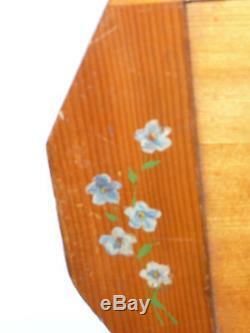 Both handles are decorated with the same small blue flowers that are incorporated in the two groups of flowers on the rectangular serving surface. The hand painted decoration is old / vintage, but there is no way to tell if it was done right after the tray was manufactured or a bit later. The handles and the edges of the two long side form a shallow (" deep on the inner edge) "gallery to keep your glasses and dishes from sliding off. 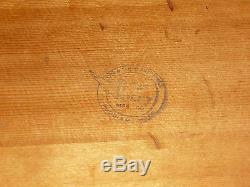 The label / mark stamped on the back has a double circle with SITKA "AIRPLANE" SPRUCE on the top curve and HOQUIAM, WASH. In the center of the circle, it says MADE BY Posey MFG. A wing (it looks like an angel wing or the wing on a pilot's flight wings) comes out at the left from the letter P of Posey. The tray is in very good condition. It is old, so there is evidence of its age and use --- little nicks, dings, rubs, etc. -- but they are quite minimal. Use it as a tray or display it as a work of art --- a genuine floral still life painting --- on the wall or on a small table top easel. This is a great piece for collectors of interesting vintage utilitarian and decorative objects made in the Pacific Northwest / Washington State. The shape / design of the tray itself has a classic Art Deco look. But, with the addition of the wonderful floral painting, it becomes a cross between streamlined Art Deco and English (or we should more properly say -- American) country garden. This unique small serving tray will definitely be a conversation piece in your home decor / entertaining. All items we sell are from a pet free and smoke free environment unless prior owner history is noted above. We are incredibly scrupulous with our descriptions of an items condition so that you can make an informed purchasing decision. Note on measurements : All measurements are approximate. 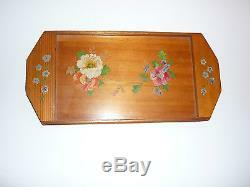 The item "Vintage American Spruce Wood Floral Serving Tray historic Posey Mfg Co Unique" is in sale since Thursday, March 05, 2015. This item is in the category "Collectibles\Decorative Collectibles\Trays, Platters". The seller is "adamsbyrdfineartsandantqs" and is located in Alexandria, Virginia. This item can be shipped to United States, Canada, United Kingdom, Denmark, Romania, Slovakia, Bulgaria, Czech republic, Finland, Hungary, Latvia, Lithuania, Malta, Estonia, Australia, Greece, Portugal, Cyprus, Slovenia, Japan, Sweden, South Korea, Indonesia, Taiwan, Thailand, Belgium, France, Hong Kong, Ireland, Netherlands, Poland, Spain, Italy, Germany, Austria, Russian federation, Israel, Mexico, New Zealand, Philippines, Singapore, Switzerland, Norway, Saudi arabia, Ukraine, United arab emirates, Qatar, Kuwait, Bahrain, Croatia, Malaysia, Chile, Colombia, Costa rica, Dominican republic, Panama, Trinidad and tobago, Guatemala, El salvador, Honduras, Jamaica, Antigua and barbuda, Aruba, Belize, Dominica, Grenada, Saint kitts and nevis, Saint lucia, Montserrat, Turks and caicos islands, Barbados, Bangladesh, Bermuda, Brunei darussalam, Bolivia, Ecuador, Egypt, French guiana, Guernsey, Gibraltar, Guadeloupe, Iceland, Jersey, Jordan, Cambodia, Cayman islands, Liechtenstein, Sri lanka, Luxembourg, Monaco, Macao, Martinique, Maldives, Nicaragua, Oman, Pakistan, Paraguay, Reunion.